Matthias F. Menne1, Jan W. Schrickel2, Georg Nickenig2, Baravan Al-Kassou2, Dominik Nelles2, Thomas Schmitz-Rode1, Ulrich Steinseifer3, Alexander Sedaghat2. 1Institute of Applied Medical Engineering, Helmholtz Institute, RWTH Aachen University, Aachen, Germany, 2Medizinische Klinik und Poliklinik II - Cardiology, Universitätsklinikum Bonn, Rheinische Friedrich-Wilhelms-Universität Bonn, Bonn, Germany, 3Monash Institute of Medical Engineering and Department of Mechanical and Aerospace Engineering, Monash University, Melbourne, Australia. OBJECTIVE: The study aimed to develop in-vitro bench tests for LAA occlusion (LAAo) devices regarding tug force and leakage. METHODS: Two LAAo devices, namely the WATCHMAN™ and the Occlutech® occluder, in the sizes 27, 30 and 33 mm were tested regarding tug force and leakage. The testing was performed at out-of-the-box conditions and after repeated resheathing in the novel in-vitro test setups. RESULTS: The tug force of the WATCHMAN™ devices was significantly higher when compared to the Occlutech® occluders at baseline and across the entire sizing range of all device sizes (maximum tug force: 2.6 ± 0.1 N for WATCHMAN™ vs. 1.8 ± 0.1 N for the Occlutech®; p < 0.01). 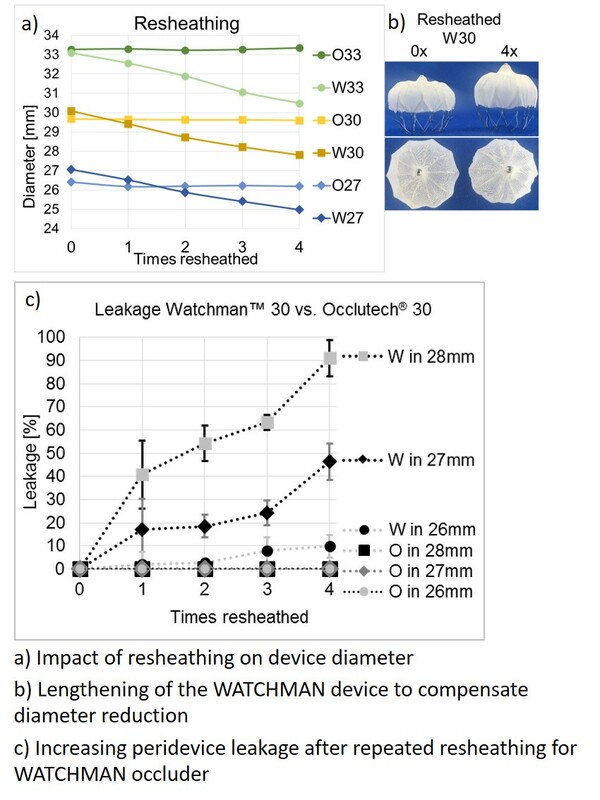 Repeated resheathing of the WATCHMAN™ devices resulted in a maximum reduction of diameter of 7.9 %, while resheating of the Occlutech® implants did not influence device diameter. No significant impact of resheathing on tug force was measured for either device. Leakage was tested in silicone models and at baseline both occluder systems showed perfect sealing. However, resheathing lead to leakage around the WATCHMAN™ devices. This Leakage increased with additional resheathing up to 91.1 ± 7.9 % after resheathing four times. CONCLUSIONS: The WATCHMAN™ LAA occluder series showed progressive deformation and increased peridevice leakage after resheathing, presumably as a result of diameter reduction. However, stability of the WATCHMAN™ was not impaired by resheathing and was significantly higher than that of the Occlutech® devices. This is most likely due to the anchoring mechanism of the WATCHMAN™ system, which hooks into the tissue rather than relying mainly on radial force.